Earn points with every Hitch ride you drive. Unlock exclusive benefits and rewards! To learn more about Member Benefits. Every $1 in Hitch fares gives you 10 points. So according to the basic earn rate, a $10 ride would give you 100 points. Want to know how many points your booking could earn you? Use the handy Hitch Club point calculator below! 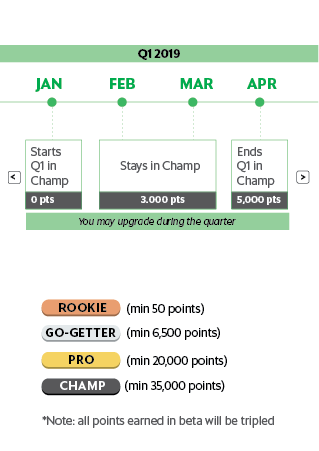 You may reach the next tier by earning enough points to meet that tier’s requirement during a calendar quarter. Conversely, you will not lose any points or get downgraded during a quarter. 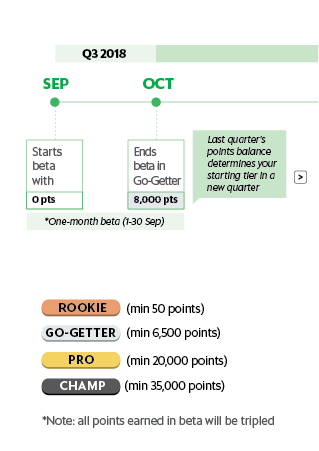 At the end of a quarter, your total points balance determines your starting tier in the new quarter. 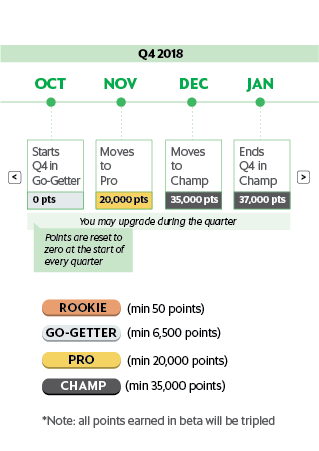 Every new quarter, your points will be reset to 0, regardless of which tier you start off in. 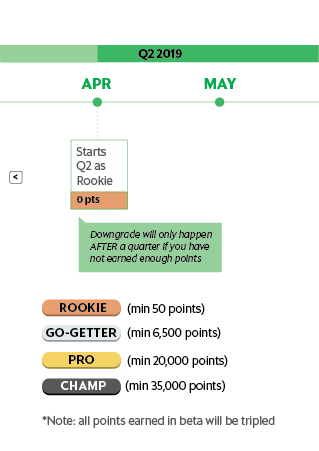 Here is an illustration of how your tier and points may change during and in-between quarters, depending on the consistency of your activity. Your Hitch Club profile (i.e. latest tier and points) is refreshed every Monday* 2pm on your Grab app feed (passenger mode), reflecting your activity from the previous Mon 0000 – Sun 2359. *If Monday is a public holiday, we’ll update it on the next working day.